Braylon Edwards at third spring achievement lunch. Photo courtesy of braylonedwardsfoundation.org. 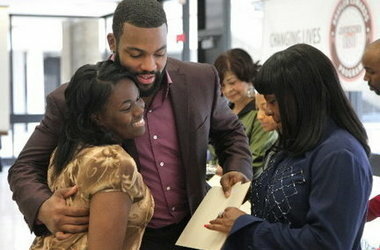 Ex-Cleveland Brown Braylon Edwards knows a man is only as good as his word, and this past Saturday Edward’s word paid off in the form of $1 million in scholarships. In 2007, two years before he was traded to the New York Jets, Edwards promised scholarships to 100 Cleveland area students to attend college through his Advance 100 Scholarship Program which is part of the Braylon Edwards Foundation according to braylonedwardsfoundation.org. “Actually, it’s Advance 100 but there are 101 in it,” said Edwards on Saturday. “We cheated.” Edwards traveled to Cleveland Ohio to attend the third annual spring achievement lunch at Cuyahoga Community College where students were recognized in front of their parents by administrators from Tri-C, Cleveland schools and the Braylon Edwards Foundation. The students applied as eighth graders with essays, questionnaires and interviews. School officials narrowed a group of 1,100 finalists down to 175 for final decisions by theBraylon Edwards Foundation., which is based in Detroit and headed by Edward’s mother, Malesa Plater. In order to receive their scholarship, each student has to maintain a 2.5 grade-point average, do 15 hours of community service yearly and attend monthly workshops on a variety of topics, from financial responsibility to interview etiquette, at Tri-C’s Metro Campus. Students may choose which college they’d like to attend. Each scholarship is estimated to be around $10,000 per person, bringing the grand total to $1 million. According to braylonedwardsfoundation.org, the students who received the scholarships were extremely grateful. "The program really helps me a lot," said Kaleb Jarvis, from Collinwood High School. "It allows me to have peace of mind that I’ll be able to go to college. He’s a great guy doing this out of the goodness of his heart," Kaleb added. "Nobody asked him to do it, and nobody tells about it. More athletes should do this." "It gave me something to believe in," said Kitaya Southivong who will attend Ohio State University on the scholarship. "And it made me believe you have to give something back to your community." In three separate tweets on May 25 Edwards announced the donation of the scholarships and made a pun to being the “second most hated man in Cleveland” behind LeBron James. During his last few years as a Cleveland Brown, Edwards was criticized by Cleveland Browns fans for his performance on the field and his trouble off the field. Follow Fastweb on Facebook! @OfficialBraylon tweeted “As the 2nd most hated man in Clev. & a man of my word, Today I will honor a promise made to 100 students in Cleveland 6 years ago the last of my Advance 100 students will graduate from my program & head off to college on scholarships that I will provide them with. Guys enjoy & embrace your new beginnings and remember your promise to me, to reach back & help someone else along the way!! !” Next year’s spring luncheon will mark graduation and be the last luncheon for the program. "We’re going to have a surprise for them," Edwards said on braylonedwardsfoundation.org. "And I’ll be here." Read more about Bad Boy Athelets Helping Students Pay for School:Barry Bonds and Michael Vick.